As the new library prepares for construction to begin in October, movement on the site (northwest corner of Railroad and 4th Ave.) has begun . The recycling center on Railroad Ave. will move to its new location near the wastewater treatment plant (198 2nd Ave.) on Friday, September 28. The new location is accessible from the east side of 2nd Ave., across from the Bohn Park entrance. While the recycling center will be open for use once the dumpsters have been relocated, the cardboard compactor will not be operable for 1-2 weeks. During this time, please break down and place cardboard in the open recycling bins. In addition, the RTD lot, located at 4th Ave. and Broadway has permanently closed as a parking lot. Alternative parking and RTD pick-up is available on Railroad Ave. (one-way road), along US-36 eastbound. XCel Energy will be installing a new gas line on the northern-most cul-de-sac of 4th Avenue. Residents within the project area will have access to and from homes. However, due to the intrusive nature of the underground work, traffic north of McCall Alley may experience delays. Xcel anticipates construction to begin on Monday, October 1. 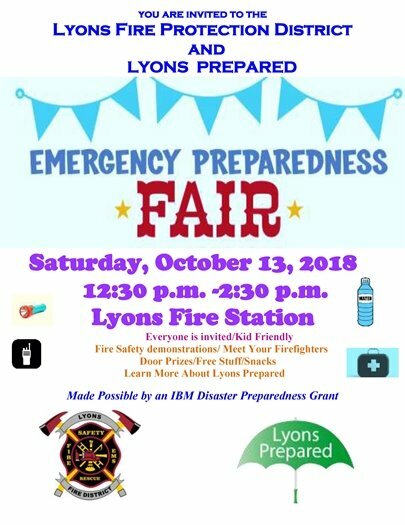 The Lyons 9 Health Fair is coming soon!! 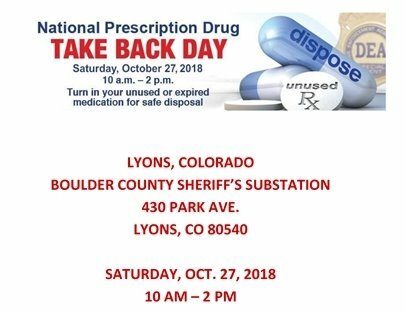 This year, the Lyons 9 Health Fair is on Saturday, September 29, from 8 a.m. to noon at the Church of Jesus Christ of Latter-Day Saints, 200 2nd Ave.. The Lyons 9 Health Fair offers a variety of free health screenings including: body in balance, breast exams, free PAP exams, flu shots (some are free if you qualify, others will be billed to your insurance), blood pressure, mental health, vision, dental, hand screening, hearing, skin screening, stress management screenings and more! We will also have representatives to assess correct child car-seat placement. Visit 9HealthFair.org for a complete list of available screenings offered. Boulder County’s Sustainability Office is providing 400 heavily-discounted trees to residents through the EnergySmart program. One discounted 5-gallon tree per household is available for only $25. This program will end on Oct. 20, 2018 or when all trees have been purchased. The program will be offered on a first-come, first-served basis and there will be two pickup locations available, one in Boulder and one in Longmont to choose during the time of checkout. Learn more and reserve your tree today! Drug abuse isn't just about street drugs - over-the-counter medications are the most commonly abused drugs in the U.S. Keeping expired or unused medication can lead to accidental drug overdose by children, drug abuse, theft and illegal distribution. Keep your family safe.